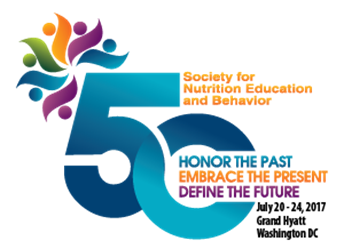 The winner of the first SNEB Student Poster Award Competition organized by the Nutrition Education for Children and Higher Education Divisions of SNEB is Tracy Noerper, MS, LDN, RD for the poster Effect of Nutrition Interventions on BMI in Youth Attending After-School Programs: A Meta-Analysis. Honorable mention goes to Damon Joyner, BS, for a poster on Associations between elementary school children's self-efficacy for eating fruits and vegetables, observed fruit and vegetable intake, and skin carotenoid concentration. Healthy feeding behaviors in early childhood are needed for healthy growth as well as social, emotional, and cognitive development. This session will introduce participants to the latest guidelines for feeding infants and toddlers ages 0 to 2, developed by an interdisciplinary panel of experts. The participant will be able to define responsive parenting/feeding and explain why it is important for developing healthy feeding behaviors. The participant will be able to recognize examples of responsive feeding. The participant will be able to discuss ways that the infant/toddler feeding guidelines can inform their work. The August article collection is now available! The posters presented at the 2017 SNEB Annual Conference are now live in a collection. View the posters today.